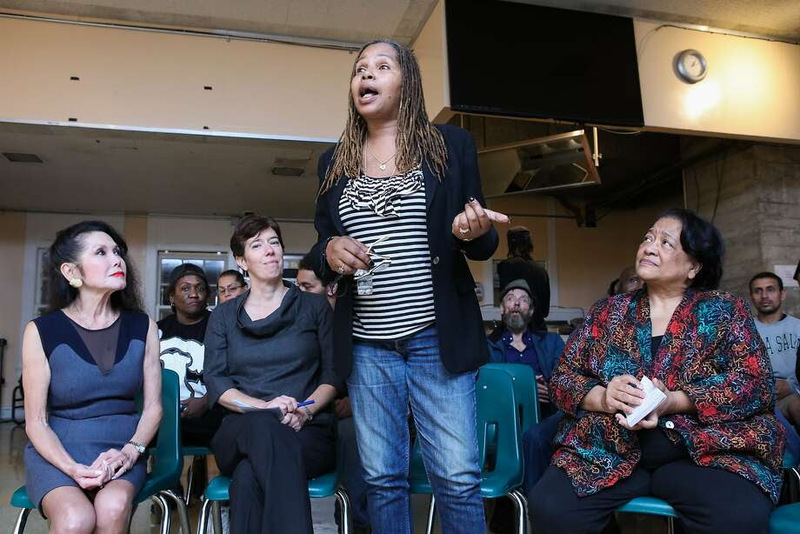 Angela Coleman (center) discusses how the programs at Glide Memorial Church have transformed her life, due, in part to Glide co- founder, Jan Mirikitani (left) in San Francisco, California on Thursday, September 17, 2015. Jan Mirikitani will be receiving a Community Leadership Award from the San Francisco Foundation at Bay Area Bold. While the Bay Area enjoys unprecedented prosperity, the chasm between rich and poor has grown to alarming dimensions, with minorities especially marginalized. 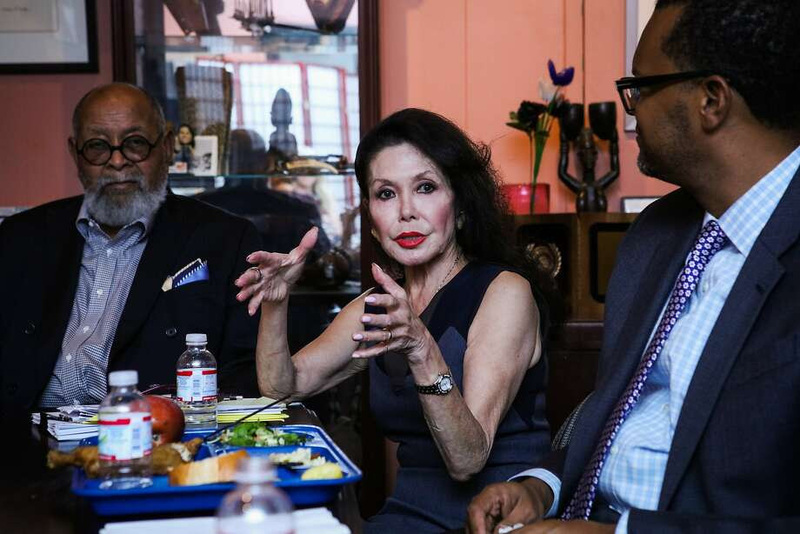 Now the San Francisco Foundation, one of the nation’s oldest and largest community foundations, is preparing to marshal its considerable resources to address this disparity. It’s drafting a proposal to reduce the wealth gap and plans to expand from its traditional grant-making role by advocating policy changes and bringing together key people from the public and private sectors. “We can embark on a path to create a climate of greater economic and racial inclusion so that race, economic status and ZIP code will no longer determine one’s future and opportunities for success,” said CEO Fred Blackwell, 45, who took over last year as head of the 67-year-old foundation. In one of its first hands-on endeavors, the foundation will host an event at Yerba Buena Center for the Arts called Bay Area Bold on Friday and Saturday, designed as both a call for collective regional action and a celebration of creativity and the arts. Friday will include a summit with TED-style talks, panels and presentations for paying guests. Saturday’s all-day free festival will feature music, dance, film and interactive performances. On Saturday, the foundation will also honor four community leaders with awards of $10,000 each. One is Janice Mirikitani, co-founder of the Glide Foundation at Glide Memorial Church, a mainstay in the Tenderloin, where it provides food, education, recovery support, temporary housing and other services. While Mirikitani is most known for her social justice activities, the award recognizes her artistic achievements. A poet laureate of San Francisco, she’s also involved in the visual arts. Jan Mirikitani (center) discusses her ideas for changing vision during a meeting at Glide Memorial Church in San Francisco, California on Thursday, September 17, 2015. Jan Mirikitani will be receiving a Community Leadership Award from the San Francisco Foundation at Bay Area Bold. Blackwell visited Glide last week and told a few dozen people who gathered after their free lunchtime meal about Mirikitani’s award, eliciting whoops and hollers that echoed through an institutional room decorated with mobiles and posters. Several rose to their feet to tell Blackwell about their lives and what brought them to Glide. 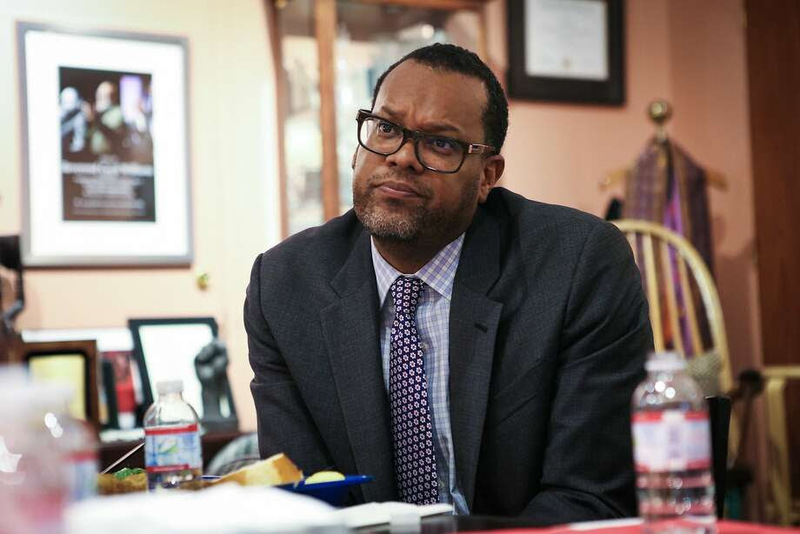 Fred Blackwell, CEO of the San Francisco Foundations listens to ideas on equity during a meeting held at Glide Memorial Church in San Francisco, California on Thursday, September 17, 2015. Afterward, Blackwell sat down to lunch with Mirikitani, husband the Rev. Cecil Williams — Glide’s co-founder — and Glide senior staff, and explained what spurred the foundation’s single-minded focus. He and his staff conducted seven months of “listening sessions” to draw comments from more than 1,000 Bay Area residents on the region’s challenges, he said. Hearing so many accounts of people’s struggles to make ends meet inspired the foundation to hone its mission. He’s got a lot to work with. The foundation has $1.3 billion in assets. Of that, $800 million is endowed money that it decides how to spend, while $500 million is in donor-advised funds — money from living grantors who decide where, when and how to distribute it, with the foundation just writing the check. The foundation handles about 500 such funds for about 700 individuals. Such funds have generated some controversy, because donors get an immediate tax write-off, but can delay actually giving the money. 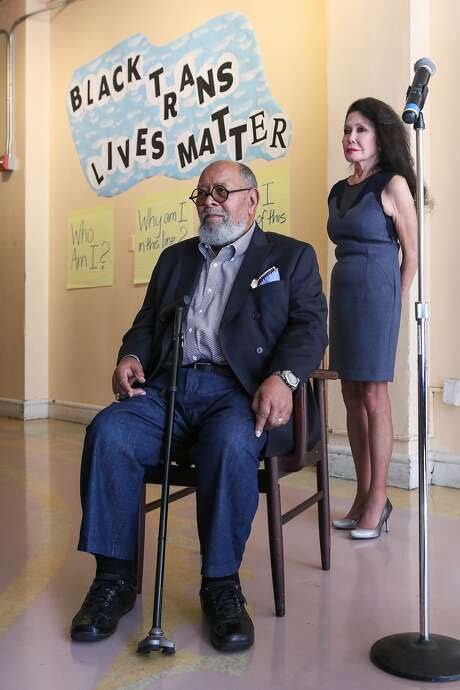 Reverend Cecil Williams and Jan Mirikitani listen as clients discuss the positive impact that Glide Memorial Church has had on their lives, in San Francisco, California on Thursday, September 17, 2015. Jan Mirikitani will be receiving a Community Leadership Award from the San Francisco Foundation at Bay Area Bold. One such person anonymously gave the foundation $34 million this year to address needs in Oakland. That gift, distributed in July to about 15 nonprofit groups, could create 2,502 jobs and 731 units of affordable housing. Housing continues to loom as a formidable issue throughout the Bay Area. “Affordable housing is as close as you can get to rocket science,” Blackwell said, asking Glide executives about the housing situation of its free-meal recipients. “Half of the people who eat here are housed; it used to be 90 percent homeless,” said Kristen Growney Yamamoto, Glide co-executive director. In surveys, they say they need the free meals so they can afford their rent. Many clearly are the working poor. “We see people in uniforms (from their jobs) in our lines on their lunch break,” said Kyriell Noon, a Glide program director. Blackwell said he sees Glide as a model for what the foundation hopes to achieve.